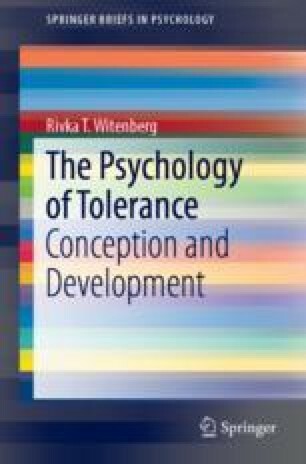 Another important aspect about children’s tolerance judgements is whether they can support and justify their tolerant stance Kuhn argues that a person’s beliefs are the source from which decisions and judgements are made (1991, 2002). The question is, do young children hold underlying beliefs which they can call on to support their tolerant and intolerant judgements. As mentioned earlier there is a paucity of research about young children’s conceptualisation of tolerance and acceptance of others who are different. However, two studies (Hogan, 2002; Witenberg, 2007) have investigated the kind of justifications and underlying beliefs young children express in support of tolerance. The studies found that appeal to the principle of fairness predominated their responses with occasional appeal to empathy.